The big Taylors Garages Premier Division clash of the day between Swineshead and Spilsby Town was settled by a solitary goal. Swineshead now look certain to claim the title after a Bert Snaith strike earned three crucial points against their nearest rivals. Old Leake found themselves in much better shape last Saturday after their previous nightmare. Two more new signings, along with the return of Lewis Baines and Pete Evison, bolstered their ranks at Coningsby. They also threw Ashley Jackson up front as he was suffering from an injury, but he still managed to score the crucial opener when he turned on the edge of the box before curling the ball into the corner. And he almost added another but the goalkeeper pushed his shot around the post. Old Leake also hit the bar before Coningsby drew level when they broke from a Leake corner and striker Shaun Boothby fired home to make it 1-1 at the interval. Jackson finally called it a day in the second half as Coningsby gained the upper hand, and they too struck the crossbar, but Old Leake were determined to hold on to their precious point and they dug in to see out the remainder of the game for a draw. Leverton visited Ruskington Rovers and it was the visitors who started the game very strongly, though both sides had chances to go ahead early. Leverton did strike first when Joe Daubney was upended just outside the box, which resulted in a Nathan Rippin’s free kick being drilled home from 20 yards to make the interval score 1-0. Once again the visitors started well after the re-start and it wasn’t long before Leverton added a second through Alex Lote, driving forward past a defender and finishing in style. The home side had a glimmer of hope when a handball in the box was given and Matt Leonard tucked home the penalty. The visitors contained the pressure for the last 10 minutesk, playing with only 10 men as all subs were used and another player was injured, to eventually see the game out as 2-1 winners. 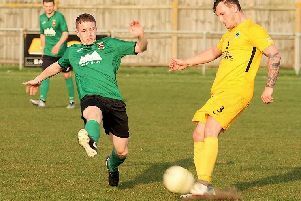 Pointon’s Dane Hardy suffered a broken leg as their Premier Division match with Benington was brought to a premature end with the scores locked at 2-2 as the game entered its final stages. Hardy broke his fibula and tibula after making an 89th minute last-ditch tackle which saw Benington awarded a last minute penalty but, due to the seriousness of the injury, the spot kick wasn’t taken as both sides agreed to call time on the match and a share of the spoils. Gavin Bell had earlier put Benington ahead with a first-half penalty, but the hosts rallied after the break despite having Jamie Andrews sent off. Ian Jaquest brought Pointon level with 20 minutes remaining and then Dom Kew fired the visitors ahead. Ben Lawrence brought Benington back on level terms late on before Hardy’s unfortunate injury ended the action. Billinghay Reserves earned a creditable 1-1 draw away at Skegness Town Reserves, with Lee Hare grabbing the all-important goal for the visitors. Charlie Arabin was on target for Skegness. Jonny Butler and Jordan Favell hit the goals for Wyberton Reserves in their 2-1 away win at Boston College. Fosdyke, not surprisingly, went down to a heavy defeat at home at the hands of leaders Railway Athletic in the Taylors Peugeot Division One. Luke Smith scored a hat-trick against his old club in the 9-0 win and Railway keeper Mark Haynes kept his third clean sheet in as many games, although he only had one save of any note to make. Curt Yeatman and Nicky Frost combined excellently to deliver six goals between them (Yeatman 4, Frost 2), while golden-oldie Scott Wiseman was denied his first goal in more than years by missing two glorious one on one chances - one being saved by the keeper while the other he managed to send soaring towards the heavens. Freiston did Railway a huge favour by sending their rivals Fulbeck United back home empty-handed after a high-scoring 7-5 victory. Perrie Dale and Tyler Bobb both scored twice while Dan Vaughan, John Tomlin and an own goal sealed the three points. Fulbeck surely won’t hit five goals many times and still find themselves on the losing side - Regan Purvis hit a hat-trick while Dan Pinfold struck twice for the visitors. Tom Johnson was on target for Horncastle Town Reserves in their home game against Fishtoft but it wasn’t enough to earn any reward following a 2-1 defeat. Fishtoft returned home with the three points following goals from Lewis Mundt and Neil Allen. Friskney came away from Old Doningtonians with maximum points following a 4-2 away win. Bob Jackson and Greg Brown gave Friskney 2-0 half-time lead and Jackson added another before Bogdon Brebeanu came off the bench and gave away a penalty which the Dons converted to make it 3-1. From the re-start Brebeanu then made amends by scoring the fourth to seal the victory although Donington did pull another back before the end to make the final score 4-2. Jamie Welsh and Mark Sharman were on target for the Dons. Park United were slow starters and soon found themselves 2-0 down after just 10 minutes at Kirton Town Reserves in their Taylors Ford Division Two clash. However, they gradually got back into the game and got a goal back through Tom Limb to make the half time score 2-1. Park started the second half much better but were rocked back on their heels when Town’s Alex Cammack scored an excellent individual goal. However, Park kept pushing forward and they reduced the arrears through Ryan Huskisson, who scored from close range. Park were then awarded a controversial penalty when the lively Alex Limb was brought down and Junior Samra tucked away the spot-kick in style. Jimmy Harris then completed the fight back when he chipped the keeper to make the final score 4-3. A Lee Bradley hat-trick helped Fishtoft Reserves to a superb 4-1 home win against Spilsby Town Reserves. Fishtoft took control of the game from the outset creating numerous chances in the first period and they deservedly took the lead midway through the half with a header from Liam Watson from a corner. And it didn’t take long for the home side to double their advantage after Lee Bradley burst through on goal before sending a rasping shot into the top corner, giving the Spilsby keeper no chance. The second half started in similar fashion and within five minutes it was 3-0 when Bradley outpaced the Spilsby backline to slot home for his second of the game. Spilsby started to come back into the game from then on and they did reduce the arrears with a consolation goal from Dominic Griffin before Bradley completed his hat-trick after being teed up Liam Watson to make the final score 4-1. Goals from Robbie Allen, Adam Newton and Lester Gabe helped Billinghay Reserves to a 3-0 home win against Swineshead A.
FC Hammers hit six goals at Boston International with new signing, Matt Howden grabbing two of the goals. Reece Snade and Kristian Taylor also bagged two goals apiece in a 6-0 victory. With Wyberton A being otherwise occupied in the cup semi-final, Boston Athletic moved to the top of the Taylors Vauxhall Division Three table following a 6-2 away win at Leverton Reserves, but both teams are assured promotion. Dave Wilson struck a hat-trick for Holbeach Bank in their 8-0 home win against Spalding Harriers. Ruslan Dulkalskis (two), Dan Goddard, Liviu Negoita and Lonuts Darie hit the other goals for The Bank. Old Doningtonians put up a brave fight away at Northgate Olympic before going down 4-3. Gary Lee, Trevor Hammond and Carl Appleyard were on target for the Dons, but the Sleaford side took maximum points with goals from Dan Broughton (two), Mark Davies and Ryan Smith. Sheridon Goodhand hit two goals for Boston College Reserves in their 6-2 away win at Mareham United. Lucas Wright, Matt Scott, Aaron Bradshaw and Adrian Kaczmerek hit the other College goals while Chris Barnes and Jonathan Barrs replied for the home side. Mareham stood firm during the first half which finished goal-less before a couple of injuries put paid to their challenge forcing them to play out the final 20 minutes with 10 men. Benington Reserves pulled off a semi-final surprise when the third division side saw off the challenge of second division outfit Pointon Reserves in the BB Insure Willoughby Shield. Despite having Dan Fox sent off early in the second half, Benington managed to take the tie into extra time and they booked their place in the final with two further goals to run out 3-1 winners. Benington’s matchwinners were Scott Ellary, Jamie Lawson and Matt Poole. Division One side Swineshead Reserves joined Benington Reserves in the final following a 4-1 away win at Wyberton A. It was a perfect test for newly-promoted Wyberton A as they faced Division One side Swinshead Reserves, but two silly mistakes gifted Swinshead a two-goal start. The Division Three side showed real character to get a goal back through Jason Allen and take the game to their opponents. With time running out, Wyberton had no choice but to go for broke and try and get the equaliser but they got caught twice on the break. Swineshead striker Chris Wing did most of the damage with a hat-trick while Josh Ullyatt-Sands also got on the score-sheet in a 4-1 away win.